Only one of my 3 plants is having this issue. A friend suggestted that the issue may be low humidity. I live in a dry area so the humidity in my house is normally below 20%. However, when I checked the humidty in my grow tent, it was 36% so I’m not actually sure it’s actually too low. Any ideas of anything else I should check? More grow details: 250W HID, 2x3x5 grow tent with 4″ inline fan. Northern Lights strain. Seeds germinated in rockwool and transplanted into 4 gallon smart pots w/ mix of peat moss and perlite. 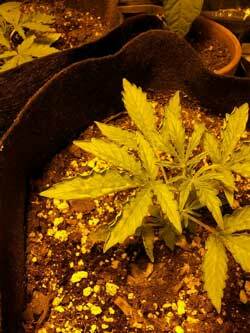 Fox Farms Nutrient Trio for nutes – following the dosing schedule but started with 1/2 doses for the first week. pH of water is 6.5-6.6 and runoff from pots tested at 6.4-6.6. This looks like the result of excessive heat, root problems (possibly from overwatering) and/or suffering from extreme humidity levels (such as very high or low humidity). 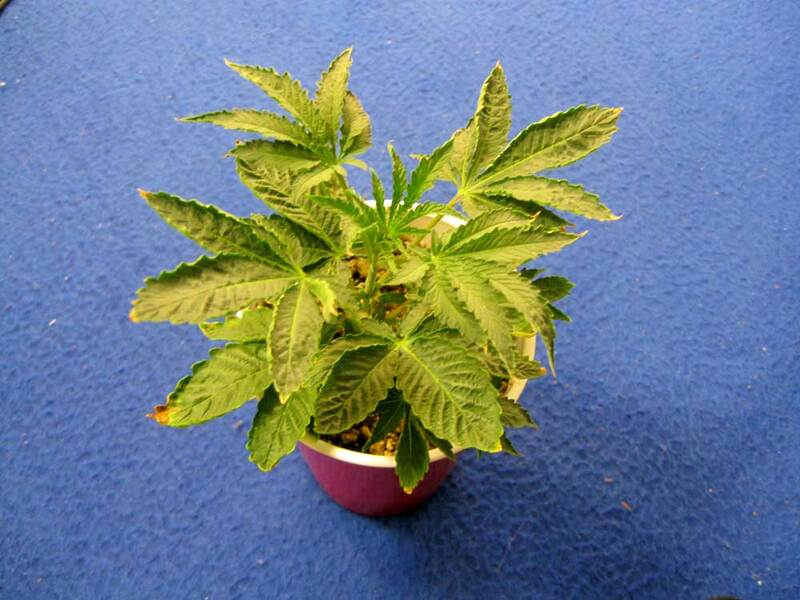 When the the serrated edges of marijuana leaves curls or tipped up like that, it’s often a sign of temperature stress, overwatering/root problems or extreme humidity levels. 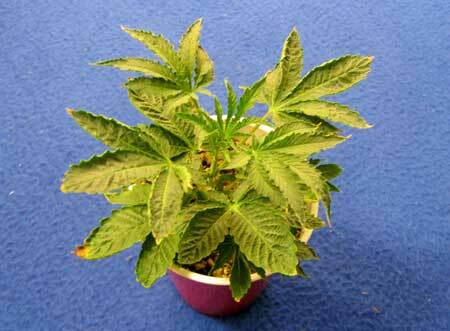 This plant was overwatered and living in high heat, which is what caused these symptoms. When the problem is low humidity, the leaf will also often fold in the middle, like a taco. What’s your temperature in your grow area? Is there a hot spot around these plants from the grow light? You mentioned that this is happening to only some of your plants. 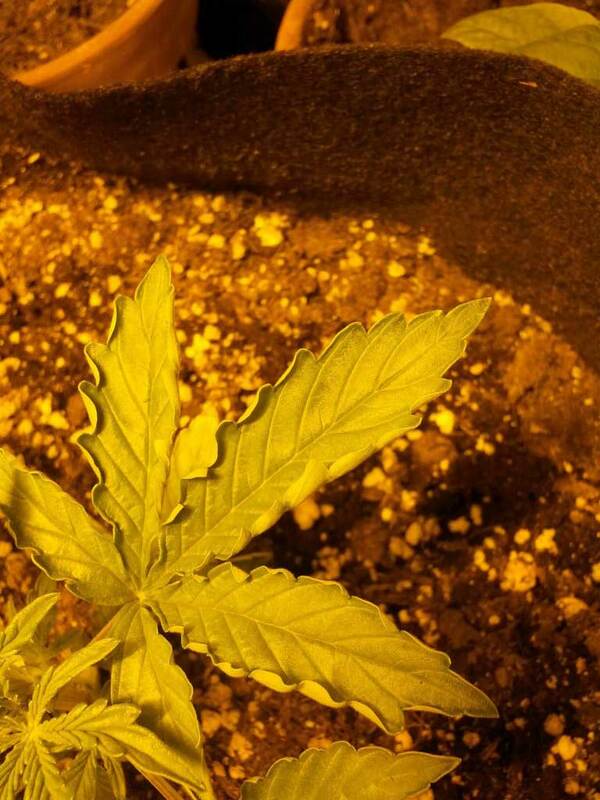 If this is happening to the plants which are closest to your grow light, that’s a hint that the problem may be temperature related. If your light is simply too close, you can move the bulb further away from these plants and this issue may resolve itself. However, these leaves are showing symptoms of heat stress, without light stress (burning / spotting), so it’s more likely that the light is a good distance away and the heat just isn’t being controlled properly. If plants are also droopy, it’s likely you’re dealing with watering or root problems. When growing with hot HID lights, good ventillation and an exhaust fan will go a long way towards preventing all these problems. If the whole grow area is too hot with stagnant air, you will want to consider venting out all that extra heat. Having good air movement, like a small fan in your grow tent blowing over the tops of your plants, can help prevent hot spots from forming directly under your grow lights. In general, if it’s too hot for you to be comfortable, it’s too hot for your plants.